Executive Functions, simply put, are important mental skills that allow us to set goals and get things done. It is an umbrella term used to describe mental faculties. The three main areas include working memory, flexible thinking, and inhibitory control (including self-control and managing emotions). One could say that Executive Functions are like mental building blocks for self-regulation, reasoning, planning, and problem solving. Children are not born with these skills; early childhood education provides experiences and can ultimately alter brain development, or formation, in the most positive ways. A key term that Dr. Montessori coined was, ‘Normalization.’ The child from three-to-six is concerned with self-construction. Normalization for this child can be observed as love of work, concentration, self-discipline, and social ability developed through one’s own rhythm. Each day the children are offered an uninterrupted period of work where they are able to move about the environment, choosing materials in which they’ve received lessons. Due to the limited number of materials, usually just one of each, the child learns flexibility and adaptability. The freedom of choice in the environment gifts the child endless opportunities to develop strong Executive Functions as aided by conscious presence, focus, attention, shifting, planning, and task initiation. Although Executive Functions are not necessarily related to intelligence, movement is. Children need purposeful movement. The hands, being the bond for development of the intellect, must be constantly moving. In the Exercises of Practical Life, the children refine their movements in a mindful way. The Guide awakes the child’s interest through careful presentations. Two subgroups of practical life are Care of Self and Care of the Environment. The child develops self-confidence as she is able to mop a spill, polish a vase, and take care of personal needs such as tying her shoes. 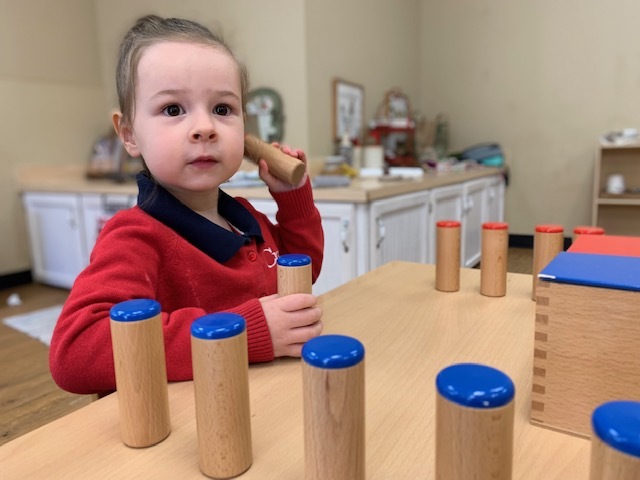 Various extensions including the silence game ignites awareness of the whole body and in turn, the child becomes conscious and comfortable with his movements. 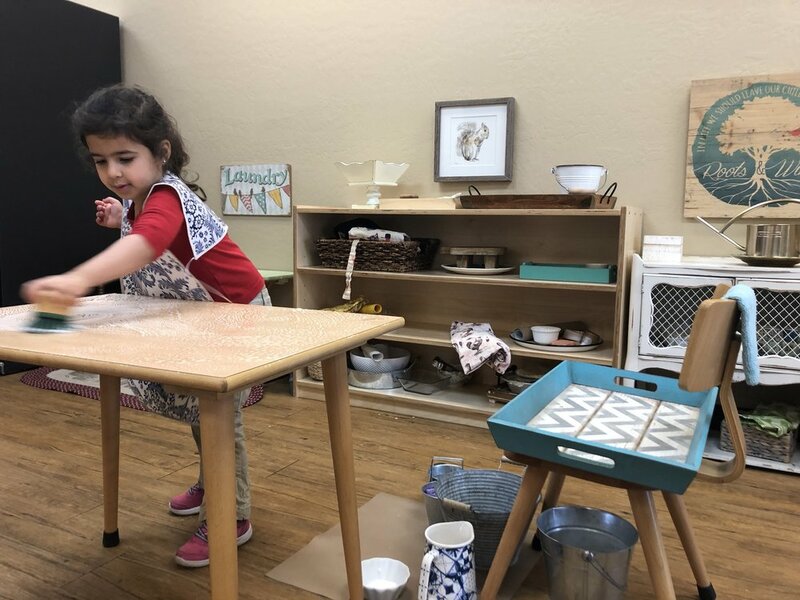 Many of the Montessori sensorial and mathematic materials are didactic, self-correcting, requiring little to no adult intervention for a child to develop strong problem solving competencies. Through peer to peer learning over a three-year-span in the Children’s House, the child articulates deep understanding of diverse concepts and develops an overall high self-esteem. 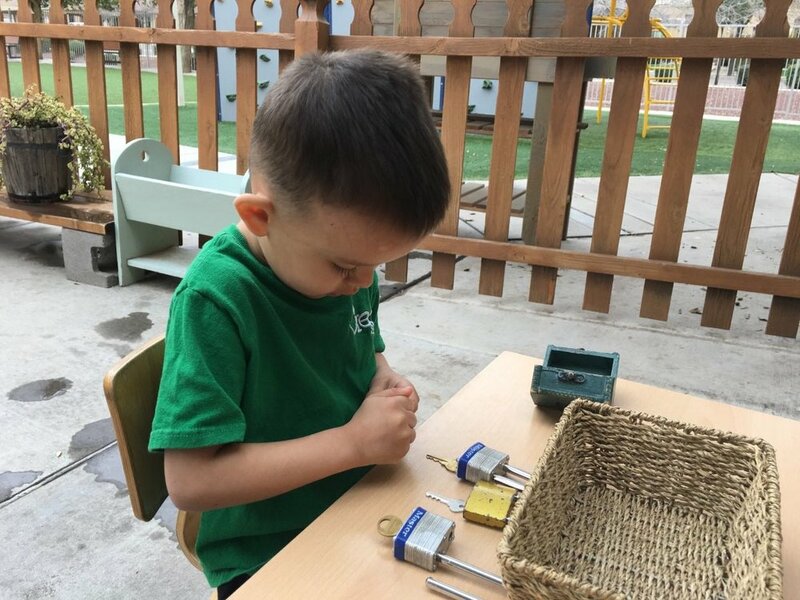 One of the main goals of Montessori which corresponds directly with the importance of the development of Executive Functions is for the child to acquire autonomy. This is demonstrated by educating the whole child. This helps the child learn to read an analogue clock, understanding time. The child demonstrates strong concentration while tracing the sandpaper numbers. 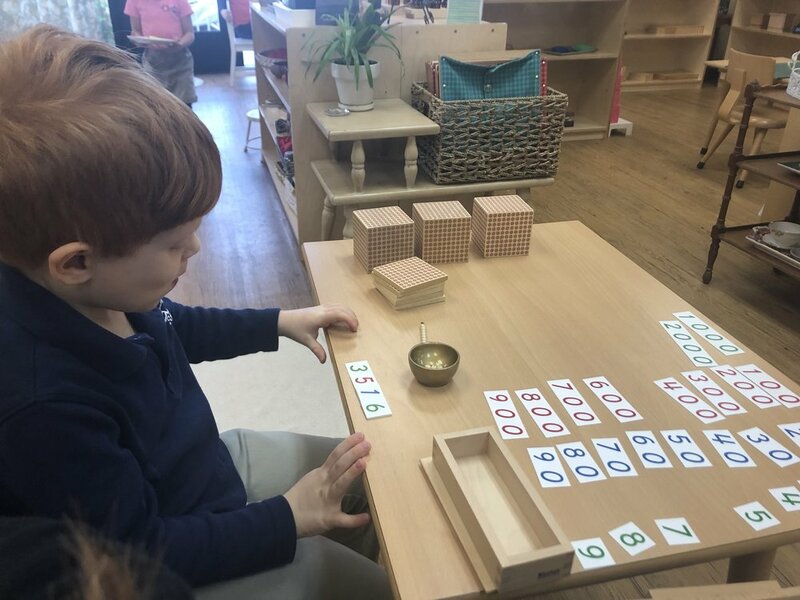 The child learns to identify large number cards for quantities 1-9000; she learns to read the numbers conventionally and applies knowledge with experience in mathematical operations. The child problem solves while learning the essential combinations for addition - a passage to memorization. This material serves as a test for the memorization of addition facts. Gardening and caring for the earth directly support the development of executive functions by starting the task and staying through until completion. Paying attention to the process supports strong EFx. Maintaining concentration while refining the auditory sense through this pairing exercise. The child writes creatively while remembering puzzle words and phonograms to compose a story. Memory is an EFx. Spring is officially here! While welcoming the warmer temps, we were able to share so many smiles through reciting many new poems and singing songs about springtime. The children took full advantage of time in our garden as well as bringing academic work outside. We discussed the process of new life evolving, life cycles of butterflies, and frogs. We also observed an explosion into art expression as many children creatively painted nature-inspired still-life’s of plants in our garden. The children treasured baking mini bagels and having fresh fruit salad for snack. 1. Place oiled parchment paper on a baking sheet. 2. In a medium bowl combine the flour, baking powder and salt and whisk well. Add the yogurt and mix until well combined, it will look like small crumbles. 3. Lightly dust flour on a work surface and remove dough from the bowl, knead the dough a few times until dough is tacky, but not sticky, about 15 turns (it should not leave dough on your hand when you pull away). 5. Top with egg wash and sprinkle both sides with seasoning of your choice. 6. Bake at 375F for 25 minutes. Let cool at least 15 minutes before cutting. We were fortunate to support more Montessori teachers in training while hosting them for practice teaching hours; Ms. Susan and Ms. Paige were delightful. We can’t wait to see the continued growth this semester. The children were excited to play with worms prior to adding them to our compost. The child learns to follow a sequence while polishing this leather saddle. It’s always fun to get our hands dirty in the garden. After learning the names of all 50 US states, the child learns the capital cities. Learning the essential combinations for addition with this memorization material. The child writes the different materials for her favorite practical life exercise. 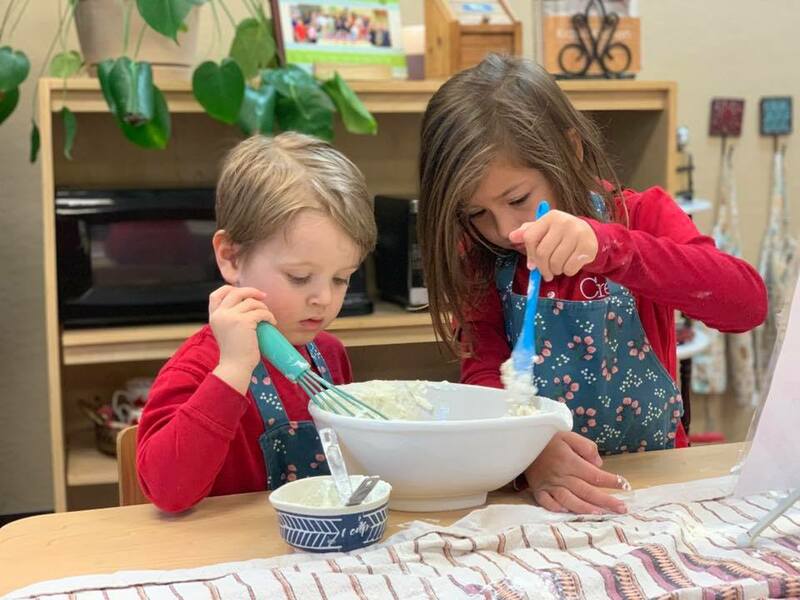 The children read the recipe and bake bagels independently. A concrete experience with exploring the essential combinations for division; the child is also introduced to remainders. The child works on a challenging long division equation containing multiple exchanges. Taking a moment to center body and mind. The child experiences learning the base and face shapes of the geometric solids. The child learns compound words. The children decipher the recipe to complete a multi-step process for baking. To explore the relationships between and among geometric shapes. To further memorization of the essential combination in division. I hope everyone had a lovely time during spring break. It is always nice to have down time to regroup, reconnect and revive the spirit. A big thank you to all for the success of the annual charity event!!! There was a lot of laughs, great food, and lots of dancing. This month we are focusing on different musical genres. Some of the different types include classical music, native American flute, and children’s songs. We have latched on to a great song by Greg and Steve titled It’s a beautiful day!!! Can't you hear the song bird singing? A beautiful day and I'd like to share it with you! I'd like to share it with, you! This is a wonderful song to sing with your children and discuss the lyrics at the dinner table. It is full of hope, love, and just all around love. Introduces the child to the purpose of words in a sequence and extra reading practice. The subtraction strip boards encourages further memorization of the essential combinations of subtraction. Working together to fill the fish food containers. Other than the obvious, this interaction helps build self-esteem, self-regulation, cooperative learning, and friendships. After harvesting the radishes, the uneaten parts of the plant are cut into small pieces (promotes fine motor skills) and mixed into the compost bin (promotes gross motor skills). This activity encourages care of the environment, organization, coordination, and intrinsic motivation for a job well done. This activity gives the child the visual impression of building a square, growing a square and shrinking a square. It is an indirect preparation of mathematics activity. Further reading exercises. The child revisits enrichment cards and now puts words to the pictures. Creating a leaf book using the botany cabinet. The child can also find the corresponding leaf in nature and add it to her book. Practicing the formation of the cursive letters by writing the days of the week. Learning how to use the dictionary excites the child to continue reading all the information this tool offers. Learning how to read and write time through our clock exercises. Exploring fabric textures through touch. The child will then go on to learn the names of all the fabrics enriching the child’s language. Formation of number writing starts long before the child puts the chalk to the board. The 3 finger grasp and refinement of fine and gross motor skills are developed through all the practical life and sensorial activities the child has experienced. This child researched all the United States flags, composed on paper what she learned, drew the flags and the corresponding state and created a book of her hard work. Setting up the numbers for the decimal system work. Here, the children are working with units, tens, hundreds, and thousands in preparation for addition. Hard to believe spring is here again! Hope you had a fantastic break. The children have been enjoying the beautiful weather and with that comes taking care of the outdoor environment. 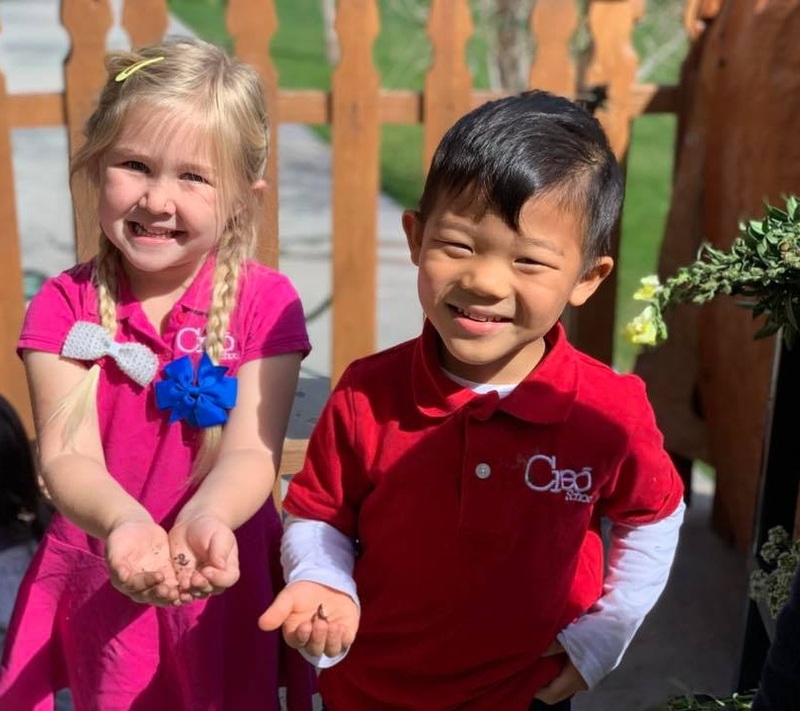 They love sweeping the outdoor area, refilling the bird feeders, gardening, and also taking nature walks, sitting on the grass to listen to a good book and of course enjoying recess in the playground. In addition to the daily snack the children are enjoying the delicious carrots from our garden. Thank you to Jude and his family for bringing their tortoise (Sheldon) for show and share. This was such a wonderful experience for the children. Also thank you to Brian, Jude’s dad, for delighting us with some beautiful music; he brought his guitar to Jude’s sun celebration and it was so much fun. And last but not least, thank you to Bobby and family for taking care of our birds Lucy and Charlie over the break. It is officially SPRING and the children are loving being in the outdoor environment! They have been taking Montessori works outside to a table or a rug to enjoy the perfect weather before it gets too hot. We have been observing and learning about the names of different leaf shapes as many are blooming right in our garden. We also have had another eggplant grow that the children were able to harvest and then bake in our oven. We had another student teacher in our classroom, Ms. Momu, who is from China. She brought wonderful stories about paper cutting and gave short lessons on this skill. She also taught the children some simple origami, sang new songs in Chinese, and brought in many beautiful books about the Chinese New Year. We are excited to see the children finish out the school year and continue to watch their growth. The child is preparing an egg to eat. The child is memorizing how to write out puzzle words after memorizing how to read them. She can check her work by flipping over the puzzle word. The child is able to sensorially feel each land and water form. The child is memorizing each sound, a fundamental skill for future reading. The child is preparing blueberry muffins for a birthday celebration. The child is working on learning how to tie bows which will help with tying shoes, tying aprons, and tying while sewing. The child is working on memorizing the essential combinations for addtion. The child traces the map, colors it in with the art medium he would like, and then labels the map. The child is introduced to visual discrimination of dimensions and is able to sensorially explore. To see the relationship of the numbers 1-9 to the number 10. The child is labeling each item in the farm by using descriptive words. To help the child become aware that adjectives can single out an object from a group.